What is Fancy Feast Chunky Cat Food? 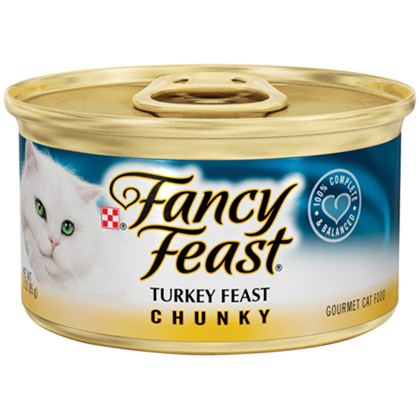 Fancy Feast Chunky is a traditional pate mixed with chunks of chicken or turkey meat. Buy Fancy Feast Chunky Cat Food with confidence with our 100% satisfaction guarantee. Fancy Feast Chunky Cat Food is a delicious meal that your cat will love. Choose your cat's favorite flavor of Fancy Feast Chunky Cat Food and get 24-3oz. cans of the desired flavor (Chunky Chicken Feast, Chunky Turkey Feast, or Chunky Chopped Grill). If your cat prefers different flavors in one pack, try our Fancy Feast Variety Packs. Ingredients: Chicken broth, chicken, meat by-products, liver, fish, turkey, wheat gluten, poultry by-products, artificial and natural flavors, soy flour, soy protein concentrate, calcium phosphate, sodium tripolyphosphate, guar gum, potassium chloride, added color, salt, taurine, carrageenan, locust bean gum, choline chloride, zinc sulfate, thiamine mononitrate, ferrous sulfate, Vitamin E supplement, niacin, copper sulfate, manganese sulfate, calcium pantothenate, Vitamin A supplement, menadione sodium bisulfite complex (source of Vitamin K activity), pyridoxine hydrochloride, riboflavin supplement, Vitamin B-12 supplement, biotin, folic acid, Vitamin D-3 supplement, potassium iodide. Ingredients: Turkey broth, turkey, meat by-products, liver, fish, wheat gluten, chicken, artificial and natural flavors, soy flour, soy protein concentrate, added color, calcium phosphate, poultry by-products, sodium tripolyphosphate, guar gum, potassium chloride, salt, locust bean gum, carrageenan, taurine, choline chloride, zinc sulfate, thiamine mononitrate, Vitamin E supplement, ferrous sulfate, niacin, copper sulfate, manganese sulfate, calcium pantothenate, Vitamin A supplement, menadione sodium bisulfite complex (source of Vitamin K activity), pyridoxine hydrochloride, riboflavin supplement, Vitamin B-12 supplement, biotin, folic acid, Vitamin D-3 supplement, potassium iodide. Ingredients: Chicken broth, meat by-products, chicken, fish, wheat gluten, artificial and natural flavors, soy flour, soy protein concentrate, added color, guar gum, calcium phosphate, potassium chloride, salt, taurine, locust bean gum, carrageenan, choline chloride, zinc sulfate, thiamine mononitrate, Vitamin E supplement, ferrous sulfate, niacin, sodium nitrite (to promote color retention), copper sulfate, manganese sulfate, calcium pantothenate, Vitamin A supplement, menadione sodium bisulfite complex (source of Vitamin K activity), pyridoxine hydrochloride, riboflavin supplement, Vitamin B-12 supplement, biotin, folic acid, Vitamin D-3 supplement, potassium iodide.